Stepping in to the great foyer of The Grand Hotel Majestic gia’ Baglioni is like stepping into a world of nostalgic perfection. The smooth glide of the 30’s marble flooring, the embrace of the co- lonial columns and the soft glow of the authentic chandelier all but force you to leave your ‘today’ outside the door and allow this grand experience to wisk you off into the seductive past of yester-year. 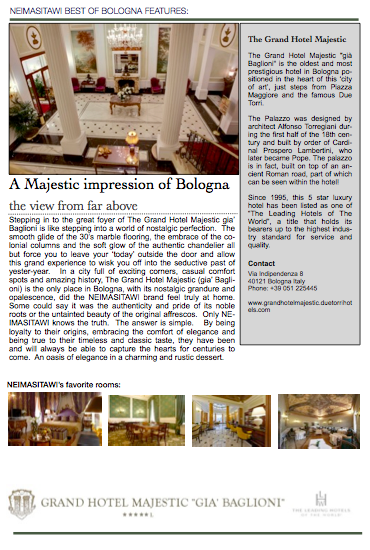 In a city full of exciting corners, casual comfort spots and amazing history, The Grand Hotel Majestic (gia’ Bagli- oni) is the only place in Bologna, with its nostalgic grandure and opalescence, did the NEIMASITAWI brand feel truly at home. Some could say it was the authenticity and pride of its noble roots or the untainted beauty of the original affrescos. Only NEIMASITAWI knows the truth. The answer is simple. By being loyalty to their origins, embracing the comfort of elegance and being true to their timeless and classic taste, they have been and will always be able to capture the hearts for centuries to come. An oasis of elegance in a charming and rustic dessert. The Grand Hotel Majestic “già Baglioni” is the oldest and most prestigious hotel in Bologna po- sitioned in the heart of this ‘city of art’, just steps from Piazza Maggiore and the famous Due Torri. The Palazzo was designed by architect Alfonso Torregiani dur- ing the first half of the 18th cen- tury and built by order of Cardinal Prospero Lambertini, who later became Pope. The palazzo is in fact, built on top of an ancient Roman road, part of which can be seen within the hotel! Since 1995, this 5 star luxury hotel has been listed as one of “The Leading Hotels of The World”, a title that holds its bearers up to the highest industry standard for service and quality. What do you get when you pair efficient, professional and personalized client relations with a keen sense of mood, artfulness and style accuracy? The answer is, Fabbrica Fotografica Communications group out of Bologna, Italy. With a savvy, efficient and globally-minded team, Fabbrica Fotografica is clearly a first choice for your visual business communications, brand identity strategy and your company’s overall graphic and photographic story. NEIMASITAWI began working with Fabbrica Fotografica in 2011 thanks to IntraInteriors Bologna design firm who immediately saw that we all shared a common philosophy; that true sophistication comes from simple, clean and timeless design aesthetic. Fabbrica Fotografica was immediately called in to engage in a strategic collaboration. First project, a complete branding re-design. From website to business card and marketing format to stationary, Fabbrica Fotografica brought NEIMASITAWI’s visual communication to the next level. Take a look below at the NEIMASITAWI choice of favorites designs by this great team. Clean, fresh and to the point, just as proper graphics should be! FABBRICA FOTOGRAFICA is a Bologna-based agency specializing in brand identity strategy both traditional and digital. Services include: photography, art direction, web and digital application design, packaging and even printing! During the Italian Week Festival in Moscow this fall, NEIMASITAWI Luxury Boutique Fashion had the great pleasure of collaborating with Mr. Pietro di Febo, president of Next Asset S.r.l. and managing director of AVRVM luxury magazine. Next Asset S.r.l was founded in Bologna in 2012 with the aim to satisfy a basic desire to bring together and fuse ideas, emotions, dreams and words. What inspired the Next Asset team was their wish to uncover the sources of the future growth of Italy. The answer was not hard to find: it simply consisted of those elements that have always made Italy great: its history, its art, its culture, creativity and originality and thus AVRVM luxury lifestyles and culture Magazine was born as a vehicle for communication of these great and rich gems. In order to truly appreciate the Italian heritage and the secrets of Bologna and its surrounding areas, one needs to come to know and love it. But this alone is not enough. Technology is guiding the economy and rapidly transforming the way in which companies interact with the market, competitors, their staff, suppliers and customers. Knowledge, growth, innovation are the tools needed to meet the challenge in local and global markets and Next Asset is ready to respond to such dynamics with tailor made, integrated marketing and communications strategies. According to di Febo, “We bring creativity and multidisciplinary skills to each individual project, offering a complete range of services and products designed to make the most of every aspect of their customer’s marketing strategy”. With this philosophy, it is no surprise that one can find AVRVM not only in the beautiful printed paper format but also online via their website, blog, twitter, facebook and even the savvy new application for Android and Apple mobile devices! Next Asset lives and breathes thanks to the passion of a dedicated team devoted to perfection and beauty; representing the essence of the imagination and inspiration that have always been the soul of this country. 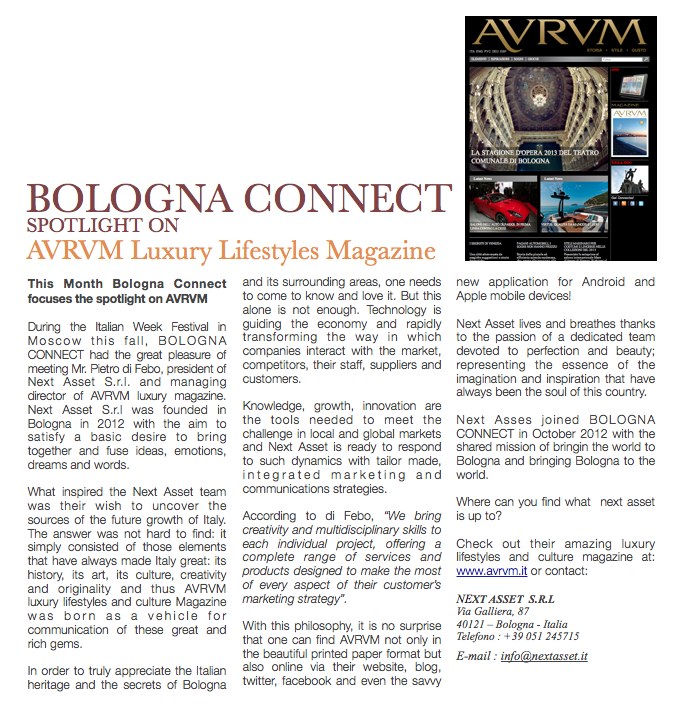 Stay tuned for the next edition of AVRVM magazine which will feature exciting news about NEIMASITAWI. Where can you find what next asset is up to?